Supporting access to energy through importing petroleum products and electricity are vital to economic growth and foster the socio-economic conditions in Mali. 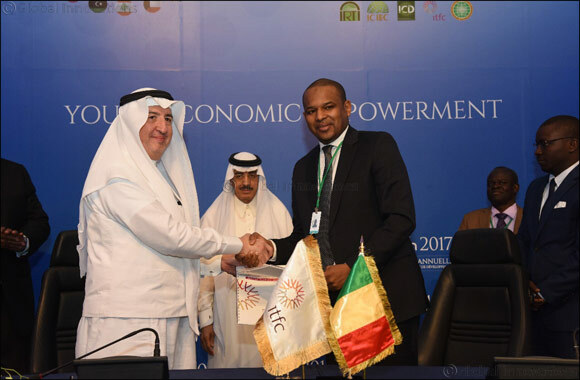 Jeddah, May 21 2017: The International Islamic Trade Finance Corporation (ITFC), a member of the Islamic Development Bank (IDB) Group, signed a € 40 million Agreement with the Government of Mali, which was signed by Dr. Boubou Cisse, Minister of Economy and Finance Mali and Eng. Hani Salem Sonbol, Chief Executive Officer of ITFC. The signing ceremony was on the sidelines of the IDB Group’s 42nd Annual Meeting that took place in Jeddah, Saudi Arabia. Mali is a non-oil producing Member Country which is also land-locked, where the import of petroleum products is vital and is a necessity for its economic growth. In addition, it supports other key industries such as manufacturing, agriculture and services. This agreement aims at financing energy, the most strategic sector in Mali. Where it includes the imports of energy commodities such as refined petroleum products and electricity. From his end, Dr. Boubou Cisse commented that “ITFC financing will contribute to Government efforts to secure electricity for the country, a critical energy component for social and economic development. Dr. Cise also mentioned that ITFC’s overall support to Mali, in the key sectors of energy and agriculture, significantly contributed to the recent country's strong economic growth”. It is worth mentioning that ITFC had provided USD231 million of financing since inception in 2008, mainly petroleum products and food stuff.